The strongest hooks and marine rigging available. Hooks are: “Mustad” type 3407 S.S. “super strong”. 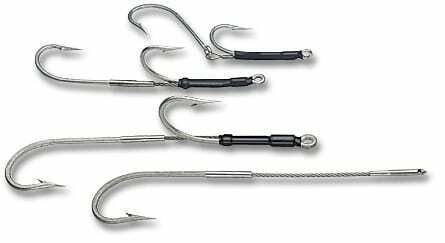 The five types of Malin Pro Rigs are: swing hook (SW), left hand double hook (HL), right hand double hook (HR), single stiff rig (HS), reverse double hook (HV) not shown, all available in 6/0 through 14/0 hook sizes.